Editor’s Note: Charles-Louis de Secondat, Baron de La Brède et de Montesquieu, the eighteenth-century French political philosopher known simply as “Montesquieu,” was immensely influential in the development of the ideas behind modern liberal democracy. The American Founders refer to his writings frequently and reverently, and every advocate of a limited government of separated powers owes something to Montesquieu’s efforts. But Montesquieu wrote about a larger variety of subjects than we normally associate with him. 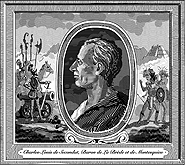 In a lecture he delivered in 1725—translated by Diana Schaub, and appearing in The New Atlantis for the first time in English—Montesquieu considers the motives that ought to move free peoples to study the sciences. To accompany this translation, below find a commentary essay by Schaub, professor of political science at Loyola College and a contributing editor to The New Atlantis. Montesquieu would make most everyone’s top-ten list of political philosophers, but he is not prominent in the ranks of natural philosophers. Following the lead of the American Founders, who referred to him as “the celebrated Montesquieu,” we associate his name with new discoveries and improvements in the science of politics rather than science proper. However, as a young man in his late twenties, decades before the publication of his masterwork, The Spirit of the Laws (1748), Montesquieu seems to have been interested in a variety of scientific questions. “Observations on natural history” (1721). Montesquieu’s counter-“Socratic turn” did not last long, however. He reverted to the human sciences in dramatic fashion with the publication of his epistolary novel, The Persian Letters, in 1721. That work of sociological and psychological brilliance catapulted him into the limelight and lifted him from Bordeaux to Paris and beyond. Despite abandoning his vivisectionist experiments on frogs and sheep’s tongues, Montesquieu wrote one more piece for the science-minded provincial academy. In 1725, he delivered his “Discourse on the motives that ought to encourage us to the sciences.” The fascination of the address, and what makes it still worthy of examination, lies in how it interweaves the political, the literary, and the scientific. Montesquieu begins with the claim that a nation’s very existence depends on “the knowledge that the arts and sciences provide.” Without such knowledge, human beings remain at the level of “savage peoples,” failing to attain “great nation” status. Montesquieu attributes the lack of political wherewithal among savage peoples to their neglect of the arts and sciences. One assumes that Montesquieu is alluding to the technological and military benefits of scientific advancement. Surprisingly though, what Montesquieu mentions is “mores” rather than know-how. He instances the Iroquois and their brutally successful campaign to conquer neighboring tribes. The example is odd, since the victory of the Iroquois is not attributed to their superior application to the arts and sciences. They are as savage as those they devour. It seems rather that savage mores leave savage peoples with only two foreign policy choices: eat or be eaten. Accordingly, Montesquieu predicts that “if Europeans had the mores of the American savages, two or three European nations would soon devour all the others” and then perhaps be devoured themselves by outsiders (as the dominant Iroquois were). Somehow, the knowledge provided by the arts and sciences makes possible more stable or self-sufficient forms of political life. The exact nature of the link between national sovereignty, civilized mores, and science remains sketchy, however. if a Descartes had come to Mexico or Peru one hundred years before Cortez and Pizarro,... then Cortez, with a handful of men, would never have destroyed the empire of Mexico, nor Pizarro that of Peru. that men, composed as they are, are not able to be immortal; that the springs of their machine, as those of all machines, wear out; that the effects of nature are only a consequence of the laws and communications of movement. Had the Aztecs and Incans understood that the world, including man, is nothing but matter in motion, they would not have been overawed by the sight of a bearded, light-skinned man (Cortez manipulated ancient myths predicting such a supernatural visitation) or panicked by the use of horses and cannon in battle. There are clear self-defense benefits that follow upon the modern disenchantment of the world: “we [Europeans] have learned to see in all these effects only pure mechanism; and so, there is no technological improvement that we cannot counter by another improvement.” An arms race is quite compatible with political stability; “a bad principle of philosophy” is not. What Montesquieu doesn’t mention is that these empires, built on belief in the supernatural, would not have fallen to Pizarro and Cortez because they already would have been toppled by the native peoples themselves once they no longer regarded their rulers as godlike. An enlightened people of Mexico could have preserved themselves against the European conquest, but Montezuma would have been gone under either scenario. Never in the seraglio of the greatest prince has there been a sultana so proud of her beauty as the oldest and ugliest rascal among them is proud of his pale olive complexion, as he sits, arms crossed, in his doorway in a Mexican town. A man of such consequence, a creature so perfect, would not work for all the wealth in the world, or persuade himself to compromise the honor and dignity of his skin by vile mechanical industry. The indigenous peoples of Mexico and Peru, lacking Cartesian principles, have haplessly exchanged home-grown despotism for foreign despotism. For Montesquieu, neither form of despotism is defensible. The alternative of which Montesquieu dreamt (“if a Descartes had come”) would have been an intellectual conquest, beneficent in its results since the sciences “cure peoples of destructive prejudices.” The native inhabitants of the New World could have protected themselves from European depredation only to the extent that they transformed their beliefs, practices, and government in the very same direction that Europe also was being progressively transformed (with industrious England, not Spain, as the model). Only by becoming at least as enlightened as the conquerors could they preserve themselves — that is to say, their lives, though not, of course, their way of life. Modernity relentlessly remakes the world in its own image. Nonetheless, there are clearly better and worse ways of being remade — better to be an Old Cartesian than one forcibly converted. The general spread of the light of science has already laid open to every view the palpable truth that the mass of mankind has not been born with saddles on their backs, nor a favored few booted and spurred, ready to ride them legitimately, by the grace of God. Perhaps not surprisingly, Montesquieu’s argument reappears in the struggle over American slavery. In 1852, the African-American abolitionist leader Martin Delany contended (in his book The Condition, Elevation, Emigration, and Destiny of the Colored People of the United States) that the reason for worldwide white hegemony is faulty theology — “a misconception of the character and ways of Deity” — on the part of the world’s colored races. According to Delany, his people trust too much in God’s special providence and fail to understand that “God’s means are laws — fixed laws of nature.” It is fine to pray for spiritual salvation, but deliverance here on earth depends on “the medium of the physical law.” When the goal is political liberty and individual elevation, God helps those who help themselves. Echoing Montesquieu, Delany recommends religious enlightenment — the renunciation of fatalist and quietist systems of belief — as the first step toward black liberation. The next two motives are described at somewhat greater length (three sentences each). The second is curiosity — not a surprising statement since science has always been thought to be driven by the urge to know just how the world works. However, Montesquieu puts an unusual spin on curiosity. He doesn’t describe the consuming curiosity about the details of some specific realm that gives rise to empirical inquiry, like, say, a fascination with the life of bugs that leads a child to become an entomologist. The curiosity he describes is about the human future: how far can science take us? Can the bounds of human knowledge be infinitely extended? Perhaps this is the curiosity experienced by the spectators of the scientific revolution rather than the participants (who tend to keep nose to grindstone). Montesquieu appropriates religious language when he summons these spectators with the rhetorical question: “Should we take no part in this good news?” All men, even non-scientists, can receive the “good news” of the gospel of science. The motive that Montesquieu calls “curiosity” is not old-fashioned wonder about the cosmos and its construction but rather an interest in the expansion of human power. We are curious about the paths that have been and, especially, those that will be traveled by the human mind. Even observers who are opposed in principle to pursuing particular paths (the cloning of human beings, for instance) might admit to curiosity about such dramatic possibilities: could we really do it? It is the force of curiosity that leads many contemporary observers to assert that if we can do it, we will do it. The juggernaut of science continues even if the good news turns out to be bad news. The love of study is almost the only eternal passion in us; all other passions leave us, as this pitiable machine that gives them to us approaches its ruin. If in this time of life [i.e., middle age] we do not give our soul suitable occupations, the soul — which is made to be occupied but is not — will fall into a terrible ennui that leads us toward annihilation; or if, revolting against nature, we stubbornly seek pleasures not made for us, they seem to retreat with our approach. Gay youth glories in its happiness, and insults us without ceasing. As youth feels all its advantages, it makes us feel them too; in the liveliest company all joy is theirs, the regrets are ours. Study cures us of these difficulties, and the pleasures it yields do not remind us that we are getting older. Whereas Montesquieu clearly expects great things from science, he does not entertain the most radical possibilities of age-retardation and the conquest of death. He does not suggest that science could fix our “pitiable machine.” Descartes, by contrast, in speaking of our destiny as the “masters and possessors of nature” looked forward to this knowledge being used not only for “the invention of an infinity of devices that would enable one to enjoy trouble-free the fruits of the earth” but also to rid us of “the frailty of old age.” Bacon likewise speaks repeatedly of the “prolongation of life” and even “immortality or continuance.” Montesquieu instead acknowledges the limits of our nature, finding consolations within. On Montesquieu’s reasoning, one would have to wonder whether men would still discover the love of study, if science succeeded in finding the elixir of youth. It seems that Montesquieu is not ready to abandon the traditional conception of philosophy as learning to die. In the closing section of the address, Montesquieu considers one final candidate for benefactor status: belles-lettres. His apology for poetry arises out of a concern for the fate of “books of pure spirit” in a scientific age. He asserts the “general utility” of such works, contrasting them with the more particular benefits associated with the sciences. From liberal learning we acquire “the art of writing, the art of formulating our ideas, of expressing them nobly, in a lively manner, with force, grace, order, and a variety that refreshes the spirit.” Being of universal value, these skills turn out to be indispensable to the sciences and mechanical arts. Montesquieu describes talented and assiduous individuals who fail to advance their line of work because they are ill-educated. His pitch for a liberal arts curriculum is remarkably reminiscent of what we hear today about the need for both “critical thinking” and “communication” skills in the workplace and the claim of the humanities to hone such skills. So far, Montesquieu’s apology for poetry has been framed in terms of utility to the scientific endeavor. His final claim, though, is independent of science. “Books that refresh the spirit” are better for “men of the world” than the amusements they would otherwise pursue: “entertainments, debauchery, slanderous conversations, and the projects and maneuverings of ambition.” Basically, the liberal arts offer relatively harmless entertainment. Montesquieu recommends that we preserve the humanities in their purest state in order to forestall the corruption of high society. This is rather like Rousseau’s argument for the value of the theater in Paris — it keeps people off the streets and out of worse trouble. There is no claim here for the superior truth of the humanities. Why is Montesquieu’s apology so lame? Was his message painfully tailored to this particular audience? We have become all too familiar with the phenomenon — witness the devoted classicists who argue for learning Latin as a vocabulary-builder to help students perform well on the SATs and who breathe not a word about the wisdom contained in classical authors. Witness the colleges and universities that routinely justify a liberal education in terms of future career opportunities and income potential, rather than the disciplined formation of a truly free soul. Defenders of the humanities have been rhetorically hobbled for a long time. [*] For Montesquieu’s deeper thoughts on what it means to be “an intelligent being,” see the first chapter of The Spirit of the Laws, entitled “On laws in their relation with the various beings,” and especially the final paragraph. Diana Schaub, a New Atlantis contributing editor, is a professor of political science at Loyola College in Maryland and a member of the Hoover Institution Task Force on the Virtues of a Free Society. Diana Schaub, "Montesquieu’s Popular Science," The New Atlantis, Number 20, Spring 2008, pp. 37-46.